As we enter the Christmas season once again, I wanted to share something I read this year that has helped me look at Christmas a little differently and feel better as it approaches. It is from the book, Things I Never Told You by Beth Vogt. It is a story about a girl that lost her twin sister in an accident and nobody in her family ever talked about it. The names in this quote are her siblings. What a huge expectation to put on a single day of the year. To decide that this day, this season, was the most wonderful of every other time of the year. Children counted down the days till Christmas. Parents overloaded their credit cards to make the day perfect and regretted it for months later. We dressed up with lights and tinsel and stars and festive fa-la-la determined to ignore whatever pain or heartache we were experiencing because, well, Christmas was wonderful. Or so everyone said and sang. And hoped and demanded. When had Christmas been wonderful? The day came again and again but I’d never recaptured any sense of joy no matter how many years separated me from the loss of my sister. There was no “wonderful” in Geoff’s Christmas. Or Jillian’s. And if Johanna was honest, she’d admit to some disappointments woven through her Christmas expectations, too. 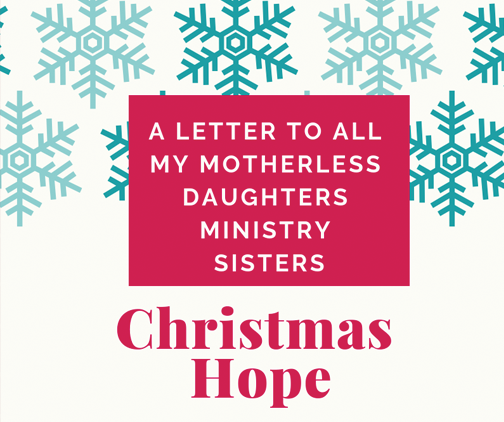 For motherless daughters, it’s normal to feel sad this time of year and wish that all the “happy families” that we are bombarded with everywhere we look, were ours. However, it’s not necessary to be sad. It is only one day out of the year. Remember the One who this season is all about, who gives us the unconditional love we have always longed for, who completely understands how we feel and what we went or are going through. Because of Him, we have the promise of that “real” joy through eternity. Even now, we can find joy in Jesus. It doesn’t come from all the “things” this season promises. It comes from the King willing to leave His throne to become human, so He can understand our lives, our pain, our hurt and offer deliverance. Not to mention His love for us. You are not alone this Christmas. God is with you, and you have many “sisters” around you who understand and feel the same way you do. This ministry is here to support you. If you need to, reach out to a former facilitator of one of our classes you’ve taken or a classmate you were in class with. If that doesn’t apply to you, connect with someone in our ministry off our website. We are here to support you. Your blog reminds us why the season happens. I wish I read this in December- it is wonderful.